It isn’t often an entire auction consists of a single collection, unless that collection is truly extraordinary. Such will be the case on Saturday, May 6th, when Bruneau & Co. Auctioneers offers an outstanding single-owner Asian art collection on Saturday, May 6th, online and at the firm’s gallery in Cranston, Rhode Island. 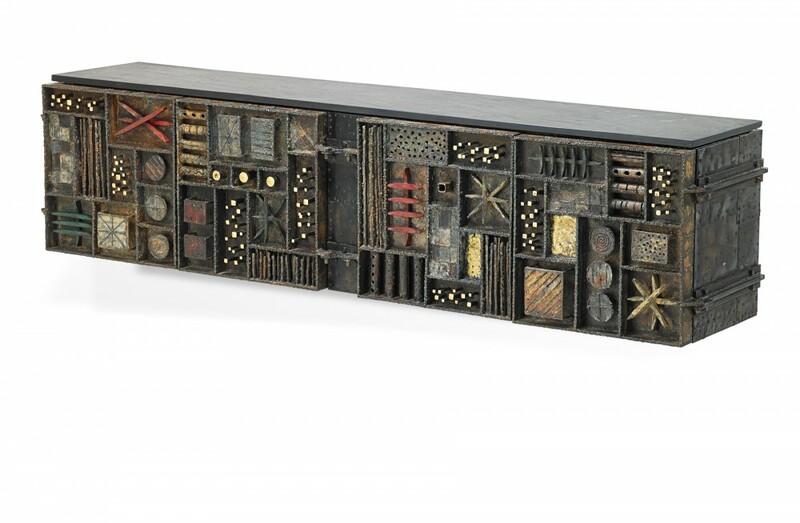 The sale will feature more than 440 lots of Chinese, Japanese, Indian and other Southeast Asian artworks and objects, with estimates ranging from a couple hundred dollars to several thousands of dollars. 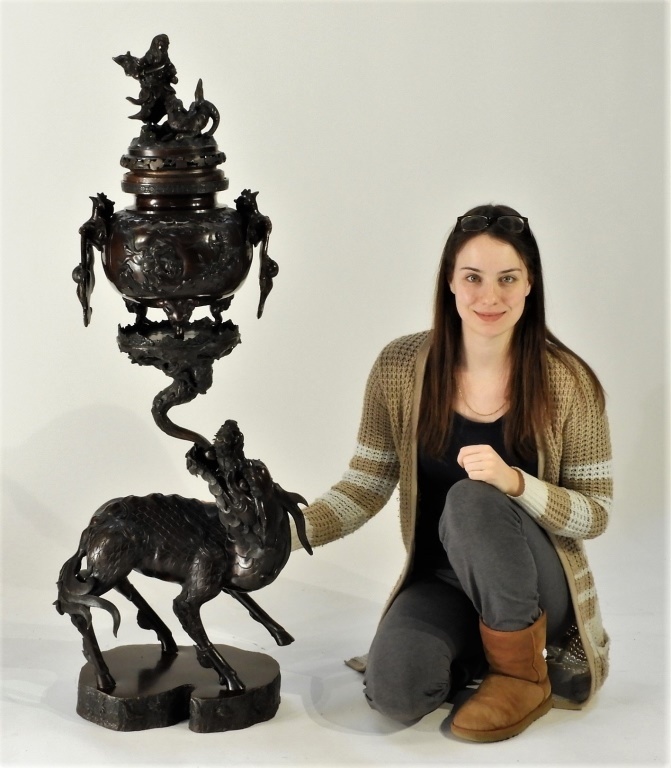 Expected top lots will include the large and impressive Japanese Meiji period (1868-1912) bronze censer pictured here, 50 ¼ inches tall (est. $4,000-$6,000); an even larger Japanese mid-20th century gilt over red lacquer carved wood Kannon Buddha, 58 inches tall (est. $2,000-$3,000); a pair of Meiji period bronze elephants, naturalistically mottled midstride with trunks raised, both 18 inches tall (est. $1,000-$2,000); and an 18th century porcelain mottled apple green crackle glaze vase, just 5 ¾ inches tall (est. $600-$900). The furniture creations of Paul Evans are, in the words of Lenny Kravitz, the entertainer and a collector of Evans’s pieces, “stunningly beautiful, stunningly ugly, stunningly tacky and stunningly sophisticated.” Kravitz spoke those words in a documentary film about the life and work of Paul Evans (1931-1987), the American-born furniture designer, sculptor and artist who is famous for his contributions to American furniture design and the American craft movement of the 1970s. He died at age 55, one day after retiring. So prized are Evans’s creations by collectors, the cabinet you see pictured here carries a pre-sale estimate triple that of the nearest competitor in Rago Arts & Auction Center’s Early 20th Century & Modern Design auctions planned for May 20-21, online and at the firm’s gallery in Lambertville, N.J. The cabinet is expected to fetch $145,000-$165,000. That’s pretty impressive, considering he’s up against names like George Nakashima, Rene Lalique and Elizabeth Eaton Burton, among many others that are also in the auction. If you start a conversation with someone who’s into artists from Louisiana and especially New Orleans, names like Clementine Hunter, Alexander Drysdale, Robert Rucker and Colette Pope Heldner normally roll off the tongue. And all those remarkable painters will be represented in Crescent City Auction Gallery’s big two-day estates auction, planned for May 13-14, online and in the firm’s New Orleans gallery. One name that isn’t often spoken alongside that pantheon of greats is Richard Clague, who lived from 1812-1873. This is intriguing for two reasons: 1. Of all the artists in the auction from that region, the one whose painting carries the highest pre-sale estimate ($60,000-$90,000) is Clague. 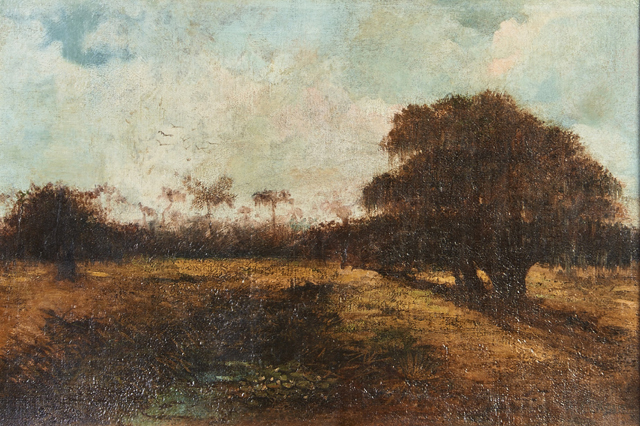 His lush oil on canvas landscape shown here, titled The Back of City Park, New Orleans, is the auction’s expected top lot. Also, 2. Clague’s not even from New Orleans, or even the US originally. He was born in France and trained in Europe, but later settled in Louisiana and became part of the Bayou School. He opened a studio in New Orleans in 1862. Is there anything more beautiful than a fine French clock? Nope. Gorgeous French-made clocks will command center stage at Fontaine’s Auction Gallery on Saturday, May 20th, when the firm conducts an Antiques & Fine Art Auction, online and at the firm’s gallery in Pittsfield, Mass. Fully seven of the top 20 high-estimate lots are clocks made in France, including the one you see here: lot #1, a visually arresting figural double ball floor clock with a 38-inch-tall standing figure of a woman cast in spelter and holding two gilt brass spheres, one in each hand. It’s expected to bring $8,000-$12,000. As beautiful as that clock is, it isn’t even the French clock with the highest estimate. That honor goes to a French industrial steam engine clock, manufactured for the Chinese market. The automaton is driven by a spring motor in the clock’s rouge marble base. There’s also a barometer with incised English words and Chinese characters, plus a thermometer. That clock carries a pre-sale estimate of $15,000-$25,000. Clocks in the auction are signed by names such as Chaveau, A. Carrier, Grobe, Monbro Aine, Japy Freres and many others. In a meeting held on Feb. 2, 1876, at the Grand Central Hotel in New York City, Chicago White Stockings owner William Hulbert persuaded an assembled group of baseball luminaries to join his effort to bring order, dignity and profitability to the fledgling sport. Supported by fellow visionaries such as Albert Spalding, Harry Wright, Nicholas Young and others, Hulbert set forth his blueprint for the destiny of professional baseball. What came out of that meeting was a hand-written, 74-page document few even knew existed until recently. 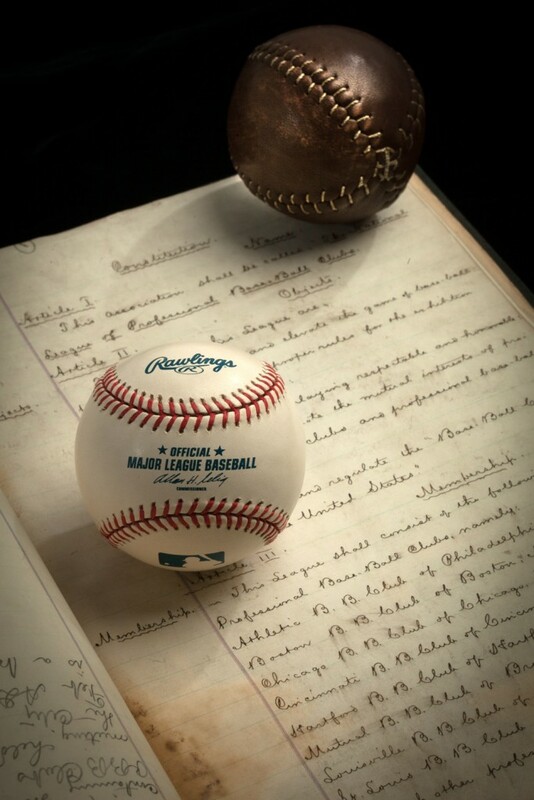 The artifact, titled Founding Documents and Original Constitution of Major League Baseball, basically ushered in an institution that would come to be a defining aspect of American culture – Major League Baseball. Now, that very document is being offered to the public by SCP Auctions, in an online-only auction that will run from May 24th to Saturday, June 10th. SCP Auctions previously handled the sale of Babe Ruth’s 1920 Yankees jersey ($4.4 million) and Kirk Gibson’s 1988 World Series home run bat ($575,000).